Jeul is linebred on the legendary ++*B Winterwood's The Medicine Man, sire of One*Oak*Hill’s famous “T-Line” (see above extended pedigree information) & has several relatives who are confirming the quality of these lines. Her beautiful dam, CH Jazz appraised EX92 as a 6 y.o. 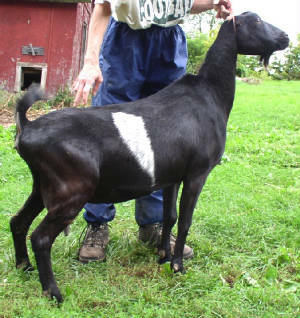 & was 3rd place Aged Doe at the 2006 ADGA National Show. Her littermate, Jala appraised overall “Excellent” as a 5 m.o. & had the distinguished honor of being chosen as one of the 2003 ADGA Spotlight Consignment kids. 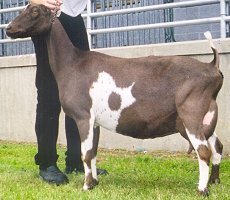 Jeul has several other sisters who are appraising very well & enjoying success in the show-ring, both regionally & nationally, with many earning their permanent championships. The most exciting addition to the list is paternal sister, CH Autumn Acres Ms Solaris being named 2006 ADGA National Grand Champion & Best Udder Recorded Grade! 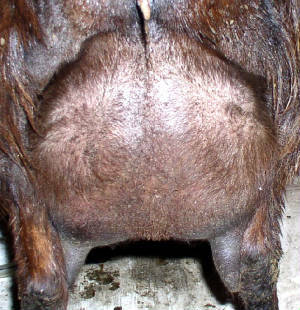 We are excited about what Jeul can contribute to our breeding program! 2007 Update: Jeul blessed us with an exceptional doe kid x Draw. 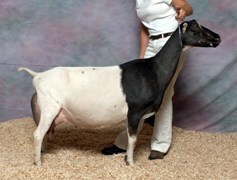 2006 ADGA National GCH & Best Udder R.G. !